If any more evidence was needed that the microbrew trend is here to stay, it's provided by Carnival Cruise Lines, as the company has installed brewing equipment on several of their ships, and hired brewmaster Colin Presby to oversee the operations. Presby’s job is to make Carnival a destination for craft beer fans like him — as well as a place for dedicated Corona drinkers to discover something new. 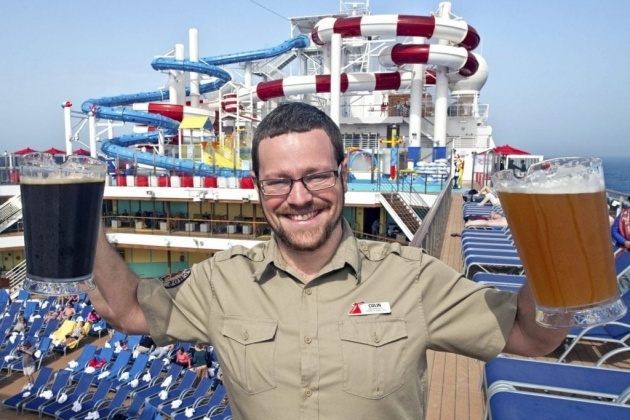 As the brewmaster for Carnival Cruise Line, the 34-year-old makes beer, talks about beer, gives brewery tours, and spends a lot of time cleaning equipment aboard the 3,960-passenger Carnival Horizon, where he lives for several months at a time. He oversees two other brewers, one of whom is stationed on Carnival Vista, a sister ship that Presby sailed on previously. The vessels, which launched in 2016 and earlier this year, are the only ones in North America with breweries on board. Carnival introduced its first brewpub with a dual goal: Offer guests a great experience on the ship and deliver quality beers, said Edward Allen, vice president of beverage operations for the cruise line. Another line in the Carnival Corp. fleet, Germany’s AIDA Cruises, had first put a brewery on a ship several years earlier, but no North American line had one until Carnival. Unlike the German operator, which worked with a land-based brewery, Carnival wanted to use its own recipes.